The economy of Azerbaijan has been dramatically affected by the drop of the oil prices and the devaluation of the national currency the Azerbaijani Manat, therefore disturbing potential future investment prospects. These monetary challenges have caused starting from 2015 an unstable situation in the country, mostly affecting national businesses. The current situation is providing an opportunity for restructuring the economic architecture of Azerbaijan focusing on the diversification of the economy and strengthening ties with international partners such as the European Union. A strategic approach towards the EU could benefit in deep the sectors of energy, trade, finance, tourism and labour market, creating a sustainable economy. The potential exit of the United Kingdom after positive results of “Brexit” from the EU also could slightly change the interaction of Azerbaijan with both parties. This research paper is based on quantitative research and qualitative research. The sources used to obtain the necessary data are the statistical databases from the Republic of Azerbaijan, Georgia, The European Union, Russian Federation, etc. ; The qualitative research has been possible with the readings of reports from international organisations such as the World Economic Forum, World Bank, Gazprom, International Energy Agency, etc., as well as the website and news from the European Union and international newspapers. The effective existing relations between the European Union and Azerbaijan since 1996 -with the signature of the Partnership and Cooperation Agreement (PCA)- until the last visit of the Vice President of the European Commission Ms. Federica Mogherini to Azerbaijan last month of February 2016, have proved a successful cooperation among both parties. Moreover, there is a will from both sides to get closer relations. The European Union as well as Azerbaijan can get benefited from a closer relation, and at this time, further steps for Azerbaijan could transform the economy in a vibrant collage of sectors active in not only the Absheron but also other regions. Different projects funded by the European Union have improved the sectors of energy, justice, agriculture and rural development with more than 14 million euros. This budget does excludes the support to higher education with the Erasmus Plus program, and other training activities. The status of European Union Association would boost the country almost in all sectors and would provide so many benefits to both EU and Azerbaijan. Georgia’s case could inspire the government of Azerbaijan to work on the adaptation of the different sectors to international standards first with the accession of the World Trade Association, following the application of EU Association. The European Union would gain better relations with a country of one of the most important regions for the EU, because it is neighbour of Russia. The First Georgia followed by Azerbaijan. These strategic steps let Europe gain new markets for its products; improve political relations, exchanging expertise, etc. However, the most important advantages for the EU of getting closer to Azerbaijan are the energy security –through the Southern Gas Corridor- and as the figure 1 shows, the possibility to access Iran, Russia and connecting Turkmenistan and Kazakhstan via the Caspian Sea. The most benefited sectors for Azerbaijan would be energy, trade, finance, tourism and labour market. As mentioned in the previous paragraph, the accession to the WTO is first stop towards accessing to international standards of production. Azerbaijan is not yet member of the WTO and it is a big obstacle for the development of international trade. On-going negotiations will hopefully soon arrive to an agreement. Another important issue is the possible exit of the United Kingdom from the European Union. The relations of Azerbaijan and the United Kingdom are very strong due to the branch of BP in Azerbaijan plus many other subcontractors. Between both countries there is an inflow of citizens that promotes the healthy relations. The Nagorno-Karabakh is still a pending issue to solve before going further into closer relations. The tensions caused by the conflict are very negative for improving the financial stability of the country as well as international partnerships. This paper will follow to make an analysis of the relevant sectors in which Azerbaijan and the European Union could benefit from a closer relation. The sector of oil is already very developed between the EU and Azerbaijan. According to the European Union report of 2015, during 2014 the total value for mineral fuels, lubricants and related materials accounts for 13,052 thousand euros of exports from Azerbaijan to the European Union. The future for the gas sector has a bright activity since the creation of the Souther Gas Corridor will transport natural gas from Azerbaijan to the European Union, passing by Georgia and Turkey. This big project is very important for the EU because it will guarantee energy security and will give provide an alternative source of natural gas from the Russian pipelines. Currently, the data available by Gazprom shows that Russian gas fed with 127,59 billion cubic metters the markets of mainly Germany and Italy, followed by the United Kingdom, France, Poland, Hungary and others. The European Union, additionally counts on specific rules of production and storage for every product. For instance, the EU obliges producers of dairy projects to apply the Policy instruments for the dairy sector. These instruments include milk quotas, public intervention and private storage, intervention agencies and aid schemes. Regarding the turnover of imports and exports between the European Union and Azerbaijan the most important data is that 98% of exports from Azerbaijan to EU stand for oil. The rest of exports are related to are machinery and transport equipment manufactured chemicals, power generation and non-electrical machinery. During 2014, a total 64 million euros turnover are related to machinery and transport equipment, 36 million euros accounts for agricultural products, 30 million euros account for manufactured chemicals and 32 million euros account for power generation and non-electrical machinery. Azerbaijan ranks very low position in the ranking for financial market development. The 114th position out of 160 countries’ economies proofs the need to restructure the financial system of the country. Additionally, the World Economic Forum stated in the Global Competitiveness Report 2015-2015 that corruption, access to financing and tax rates are the most problematic factors for doing business in Azerbaijan. Azerbaijan financial system could gain more quality by copying financial patterns from the European Union. The sharing of data with the EU regarding financial issues could be very useful to fight financial international crimes such as money laundering, evasion of capitals, bribery and corruption, cyber-crime, market abuse and insider dealing or the violation of security information. Visa liberalisation is one of the biggest benefits for both the European Union and Azerbaijan. The fact of EU citizens not being able to visit Azerbaijan freely has an impact especially in the sector of tourism. The Visa Liberalisation Plan is one a very successful practise in Moldova and recently in Ukraine and Georgia. The results in Moldova showed a very low percentage of illegal immigration or high rates of inflow asylum seekers. The government of Azerbaijan already counts with biometric passports and is ready to be part of the Visa Liberalisation Plan of the EU. On the other hand, still international visitors count on obstacles to easily access to Azerbaijan. The long term of application discourages international visitors to visit Azerbaijan. The fact of creating more flexible regulations for EU citizens in the matter of free movement, or at least more flexibility for obtaining visa (for example upon arrival at international airports or borders) would put Baku in one of the top lists for organising international events like conferences in which organisers would not have to issue visas for participants. The most relevant information regarding tourism is that Azerbaijan received in 2015 2,004,00017 international tourists, and Georgia in 2014 5,515,559 international tourists. Considering that the natural resources of both countries are similar, that Azerbaijan organised the 2015 Baku European Games and that the labour force of Georgia is half of the Azerbaijani one this means that the sector of tourism in Azerbaijan is in a worrying situation. The fact that Azerbaijan requires visa for international tourists is a big obstacle for the development of this industry. Azerbaijan should copy the example of Georgia to attract international tourists by unblocking tourist visas and focusing investment in rural tourism and information adapted to the needs of the target markets. The value of tourism in the Georgian GDP is 6% against 4.1% related to Azerbaijan. If Azerbaijan would let EU citizens to enter in the country the share in the GDP could increase at least to 6%. The number of Azerbaijani young experts is increasing due to the educational programs funded by the government of Azebaijan to study abroad and also because of the Erasmus Plus program that lets university students to spend some periods at partner universities in European Union countries. The exchange of labour force could be very beneficial for both the EU and Azerbaijan, since they could provide different expertise working at the same international standards. The recent result of the Referendum of the United Kingdom to leave the European Union will not affect negatively the relations of Azerbaijan with the UK. The role of British firms are crucial for the development of the economy of Azerbaijan, and in terms of investment the UK is the 2nd investor in the in non-oil sector, and it accounts for the 16% of the whole foreign investment. The United Kingdom stays strong as a partner country of Azerbaijan in terms of trade. For instance the total value of UK exports to Azerbaijan in 2014 accounted for £730 million and the British investment in Azerbaijan ammounted $153.3 million in 2014. The exports of the UK to Azerbaijan are related audit & law firm services, engineering services as well as oil and gas equipment. In terms of movement of individuals among both countries the data is also important. In 2014 according to the State Statistical Committee of the Republic of Azerbaijan 33,000 British nationals visited Azerbaijan and around 7,000 British citizens worked in the country. The accession to the WTO is for Azerbaijan the main important thing to sign in order to access international markets and especially to start negotiations with the European Union regarding the Deep and Comprehensive Free Trade Area. The status of Association to the European Union would be the master key to bring to the country a new era of benefits related to trade, mobility, education, labour force and finance. The Southern Gas Corridor is a majestic project that will bring to the European Union an alternative to the Russian gas, providing energy security. The visa liberalisation is very needy in order to attract the promote mobility and also to attract the attention of international tourists to Azerbaijan. Until now visas are a big obstacle to visit Azerbaijan for EU citizens. The financial Azerbaijan of Azerbaijan is going in the right way towards transparency, fighting corruption and black market, etc. with the initiative of Mr. M. Natiq Amirov. Still many developments in this area are advised, especially by sharing financial information with the EU in order to fight international financial crimes. The European Union is a good partner for Azerbaijan because could provide new markets that would guarantee a sustainable trade. However, the adaptation to international standards from WTO and especially from EU will imply big investments, trainings, transformation of the national structure in different sectors and finally the adaptation of goods to the international standards. The recent Referendum of the European Union in the United Kingdom is not a threat for the relations of Azerbaijan with the UK, due to the strong relations related to energy trade, engineering, law firm and audit services. To sum up, the closer ties between the European Union and Azerbaijan would benefit both parties, but there is a long way to work on the restoration of regulations, training, international standards, urban development and investment. 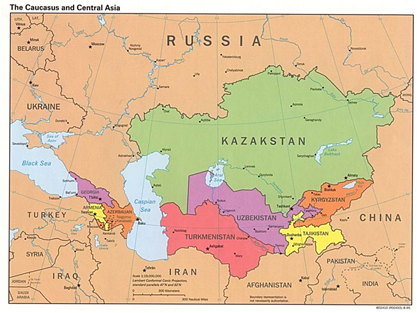 CAREC countries: Afghanistan, Azerbaijan, People's Republic of China, Kazakhstan, Kyrgyz Republic, Mongolia, Pakistan, Tajikistan, Turkmenistan, and Uzbekistan.